So a few months back a friend of mine pinned a quilt to one of her boards on Pinterest. It was of a spectacular triangle quilt. I mentioned how much I loved it, she mentioned we should make it, and the next thing I know I'm standing in front of the cotton solids at Hobby Lobby picking out colors. What?!? I should preface this all by saying that I am not a quilter. In fact I have never in my life actually made a quilt. Anyhow, I acquired a triangle ruler from a quilter-friend and we finally found a night to get the pieces cut out. I had no idea, but that was the beginning of a huge nightmare for a girl that loves to just "get things done." Quilting is a long, tiresome, patience-practicing, finger-aching, cursing, crying, business. It. Is. Done! And I'll never make one again! 1. Laying it out after cutting. I don't know how many times I about sliced my fingers off. 2. Pieced and looking pretty. I also have no idea what to do next so it sits in the corner for 2 weeks. 3. Prepping for pin basting. This is where you think you are almost done, but no no no my friend you are not even close. 4. Machine quilting. Enter tears. The puckering cannot be stopped. 5. Machine binding. Getting close!!! 6. Finally hand stitched opposite side of binding. Happy dance here with sore fingers held high! well... it looks great! i am no quilter either. It looks great! I love the color combos. I'm definitely not a quilter, but there are times that I wish I could quilt. I don't think I have the precision needed to quilt. ha ha ha ha, that was hilarious. It turned out so great!!! Way to go!!! But it turned out sooo cool. I love it. Give it some time and just maybe you'll want to do it again (but something easier). 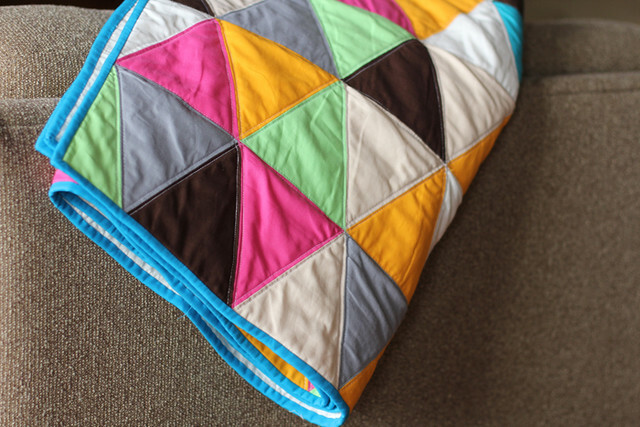 Amazing that is your first quilt ever. Kudos. It's beautiful! I could never do that. The sewing needle would inexplicably make it's way into my eye. I have no skill or patience for sewing. I'm laaaame. LOVE it! Prepare to cry the first time it gets pooped/vomited/something gross on by a small person. It looks great! Good job! that looks fantastic! I love the triangles- but can imagine how much more difficult that could be than just straight forward squares:) Nice job! Totally awesome! You'll be glad you did it (once your fingers heal). That is beautiful! You did a great job on it! That is a tough pattern to start with for sure. All those little points to match together, and all the machine quilted lines. You really did a good job on it. I really like quilting but I don't even dare do a full triangle quilt yet, I'm a wuss I guess. It's always fun to try new things, but ya, it's a lot of work. I guess I'm de-lurking now ;). I found you from Sheena's blog a long time ago and I love your pinterest. I think we have similar tastes in things. Anyway, give yourself a pat on the back! That's a tough one and you did an awesome job!